The concept map (CM) has been adopted to improve teaching effects because it can effectively reduce the bad effects of e-learning, such as disorientation and cognition load, and keep aware of their knowledge learning path. 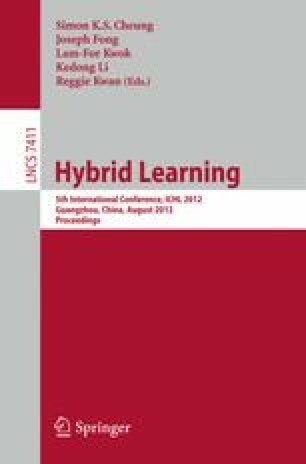 But adaptive learning systems (ALS) which integrated the CM perform well in extracting and managing the tacit knowledge in a static way which haven’t made full use of the concept map. We introduce a variant of the CM, the colored concept map (CCM), which can help learners track their learning condition and path in a dynamic way in order to get a good performance under effective self-monitoring. In order to serve better adaptive learning experience for learners, the prototype of the visualization learning system based on the CCM (VLS-CCM) is developed. The data analysis of the pilot study showed that the VLS-CCM improved learners’ performance in a more effective way than the traditional CM-based ALS did. The research work is supported by MOE Foundation for Youth (NO. ECA090443) under National Education Sciences Planning.